ECE Associate Professor Bruce Jacob is the lead author of a comprehensive new book on computer engineering, titled Memory Systems: Cache, DRAM, and Disk. The purpose of the book is to bring the reader to a level of understanding at which the physical design and software emulation of the entire memory hierarchy is possible. The book, which represents over 100 person-years of research and accumulated knowledge, was co-authored by Jacob, Spencer Ng of Hitachi Global Storage Technologies, and David Wang of MetaRAM, Inc., with additional contributions by Samuel Rodriguez. Published by Morgan Kaufmann Publishers, the book is due out on September 4, 2007. 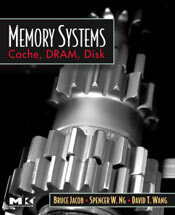 Memory Systems: Cache, DRAM, Disk is the first book to comprehensively cover the logical and physical design, operation, performance characteristics and resulting design trade-offs, and the energy consumption of modern memory hierarchies. Jacob and his co-authors explain that expertise in this area will become increasingly important as memory hierarchy continues to be recognized as the performance bottleneck for today's high-performance microprocessors. Reviewers have noted the book for being "remarkable in scope and depth," and "[filling] a huge void in the literature about modern computer architecture." The book is approximately 1,000 pages in length. For more information about the book, visit the Morgan Kaufmann Publishers website.